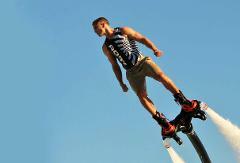 This is the all-inclusive pack to learn all the basics of Jetpack flying and learn all the tricks. You get 30 min of Pre-Flight training and 60 min of actual Flight time. This pack gives you the most Airtime. 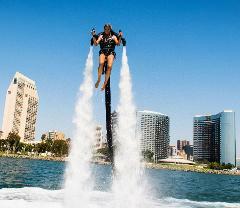 This is the all-inclusive pack to learn all the basics of Flyboarding and learn all the tricks. You get 30 min Pre-Flight training and preparation and 60 min actual Flight time. This pack gives you the most Airtime. 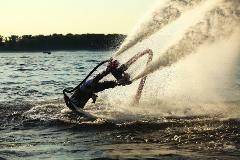 This is a great pack to learn all the basics of flyboard and learn some or most of the tricks. You get 30 min Pre-Flight training and preparation and 30 min actual Flight time. This pack is the most recommended to get the full experience.